Have a hard time to loose weight? Are you a dancer/athlete/martial artist who wants to perform better, and/or needs to drop couple lbs for the weigh in? Suffering from eating disorders, chronic fatigue, depression, anxiety? Got headaches, allergies? Do you have acne, psoriasis, eczema that doesn't go away? How about PMS, candida, yeast infection, constipation, IBS and many other serious disorders? If you answered YES to any of these, cleansing your colon may be the solution to the problem. Visit the COLONIC page for details. 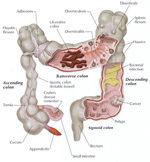 "Toxic colon is a precursor of many illness. Colon irrigation could help you to prevent what you can't cure"
Customized treatment, a combination of different massage modalities to relieve muscle tension due to sports, improper posture, injuries. Shiatsu, reflexology, neuromuscular therapy a.k.a. NMT, lymphatic drainage, swedish and deep tissue massage will be integrated in your treatment, based on your personal need. Please note: Treatment can be done in the 2nd and 3rd trimester only! Visit Andrea and experience the overall healing effect of the variety of treatments she has to offer. She is located in Deerfield Beach, but her services are not limited to the local area only. Many of her clients travel from Fort Lauderdale, Pompano Beach, Coral Springs, Boca Raton, Delray Beach, even as far as from Hollywood, Aventura, Weston, Parkland, Miami Beach and Palm Beach for the memorable experience. Get FREE JUICE PLUS gummy bears for your children! Ask Andrea how.